Chino Hills Cosmetic Dentist, Cosmetic Dentistry | Dental Care of Chino Hills > Dental Care > Dental implants: Are they safe to use? Dental implants are one of the many solutions in filling the gap caused by tooth loss. They are made from titanium alloy which is surgically embedded on your jaw bones. Unlike any other dental restorations which prevent shifting of the remaining teeth in the jaw, dental implants function as tooth roots which help in preventing bone loss in the jaw bones. The implants are also used to anchor restorations in place like dental crowns, bridges and dentures. They provide the stability and strength needed by the restorations in performing the natural functions of the teeth such as chewing and speaking. Like any other foreign materials implanted inside the human body, the use of dental implants are plagued with questions regarding its safety. 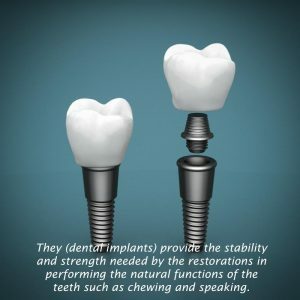 However, according to experts, dental implants are proven to be safe because they are made from biocompatible materials – materials accepted by the body, which allow the implant to fuse with the bone tissues of the jaw. This process is called osseintegration, which lasts up to 6 weeks. Dental implant complications such as incorrect positioning, nerve and blood tissue damage, and overloading are often caused by surgeons who lack proper training and experience in performing the dental implant procedure. So it is very important to look for an oral maxillofacial surgeon who is well-known in this field and has gain a network of clientele who can provide positive feedback regarding their experience in undergoing the procedure. When in doubt, it is best to discuss with your dentist how safe are dental implants before proceeding with the procedure.